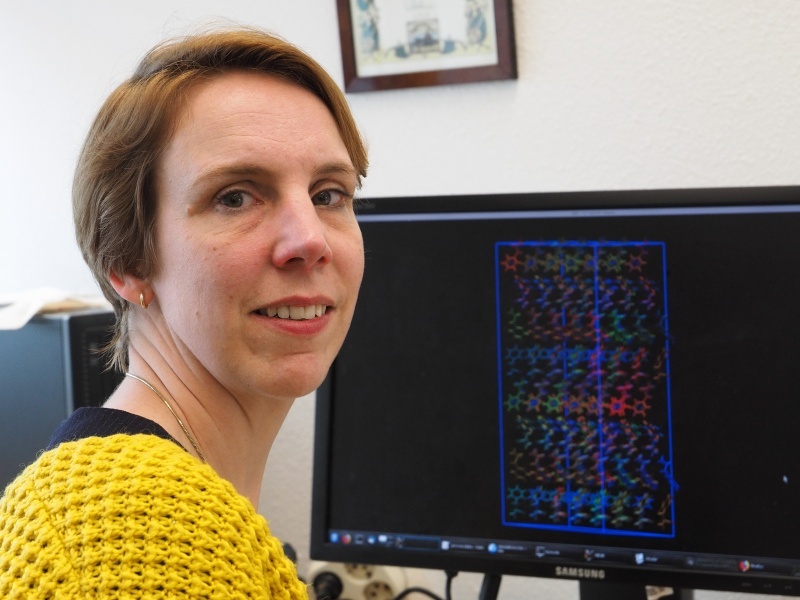 Herma Cuppen was recently appointed professor in the field of Computational Chemistry at IMM. She studies how individual molecules and atoms behave inside a solid such as a crystal, by calculating how they move and stack. The knowledge she creates has extremely diverse implications, ranging from the formation of the building blocks of life in space, to the properties of medicines. As early as during her PhD research, which she performed from 2000 to 2004 within the IMM in the Solid State Chemistry group with prof. Elias Vlieg, Herma looked for practical applications. She studied the molecules of, among others, the painkiller paracetamol and the sweetener aspartame, by calculating how they stack to form a crystal and predicting the shape of these crystals. “For the pharmaceutical or food industry, crystals that look like needles or plates are inconvenient because they clog up filters. Understanding how different crystal shapes are formed is therefore valuable,” Herma explains. Her PhD thesis was rewarded with the ‘Kristalgroeiprijs’ for excellent research. The research topics Herma chose for her group reflect the two topics that played a major role in her own scientifc career: the transition of crystals from organic compounds from one structure to the other and the formation and evolution of interstellar ices. Asked to explain the first one, Herma jumps up excitedly to show a movie clip in which a needle shaped crystal suddenly jolts away. “These are the famous jumping crystals. When these are heated up, they undergo a phase change, which means the molecules in the crystal are rearranged. This causes the jump. But we don’t know exactly how the rearrangement takes place. Using calculations, I may be able to help solve this problem,” she explains. Jumping crystals may be used as actuators; small moving parts in electronics or machines.